June 26th, 2013 | Wheaton World Wide Moving. 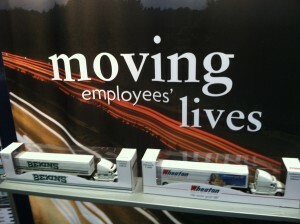 Periodically, guest bloggers will appear on Wheaton’s We Move Your Life Blog. In our Sales Spectrum Series, you will hear from members of Wheaton’s Corporate Sales Team on a variety of topics dealing with the facets of the moving industry. 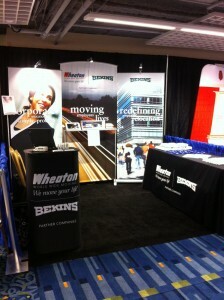 In this post, you will learn about a recent trade show that Wheaton World Wide Moving attended. Returning last week from the Society for Human Resource Management’s (SHRM) Annual Conference in Chicago, our Sales team was abuzz with exciting ideas. This conference, the largest of its kind in the world, brings together HR professionals as well as Professional Development, Talent Management, Insurance and Corporate Relocation professionals… just to name a few. Heather Stafford, Wheaton’s Sales Administrator, recapped her experience in Chicago and kept us up to date on some of her favorite and most memorable happenings of the week. I’ve been going to SHRM’s Annual Conference for four years, so I wouldn’t call myself a novice, but I find that I continue to learn new things every year. The biggest change I noticed this year was the presence and amount of social media used. The time spent on social media seems to increase every year and I find that fascinating. I was amazed not only by the use of Twitter during the conference, but also at the amount of promotion that happened even before we walked through the front doors of McCormick Place. The infographics, blogs (like the one Wheaton wrote!) and Tweets that I read leading up to the conference really got me excited to attend. Long days and trade shows are almost synonymous with each other. You can always expect to be tired after a day at the SHRM conference, but the days are fun and full of conversations and networking. I particularly enjoyed the opening reception on Sunday. Full of free and delicious appetizers and cocktails, this reception brings tons of people together and is one of the most valuable days of the conference. I am able to make a lot of quality connections early on and they seem to last throughout the conference and even long after the conference has ended. Impressive keynote speakers are also a SHRM staple as well as one of my favorite parts. This year topped the list with names like Gabby Giffords, Hillary Clinton and Blake Mycoskie. You really can’t beat that lineup. SHRM really does bring the best of the best to their conference every year and you can always expect to learn a lot. Of course, I love representing Wheaton and taking about our top notch corporate relocation program. It was great to connect with old friends and new faces and it was also exciting to give away a Kindle Fire to Deana Moylan from The University of Texas MD Anderson Cancer Center. I would have to say though that my favorite part of the whole conference was the entertainment: the Kelly Clarkson concert. There was so much positive energy in the room, Kelly put on an amazing show, and it was great to see the attendees having such a fun time. It was definitely one of the most fun and memorable parts of the conference. I always enjoy attending SHRM’s Annual Conference and look forward to it all year. I know that I’m going to have the opportunity to showcase our Corporate Relo program and come away with a great list of potential clients. The conference is always well-run, effectively scheduled, and organized. With an impressive lineup of keynote speakers and attendees, it’s a conference that I genuinely look forward to coming to every year. I can’t wait to see what’s in store for SHRM14! Heather Stafford is Wheaton World Wide Moving’s Sales Administrator. You can connect with Heather on Twitter and LinkedIn to learn more about her experiences at SHRM and Wheaton’s Corporate Relocation program.